Last year, we started a series of 2-part posts we called “Babies’ Firsts.” In the first part, we ask our readers to answer a few questions about the first time their babies did something exciting. Then, in the second part, we explained when and how babies tend to achieve the highlighted milestone. So far, we've covered smiling, crawling, and rolling over, but it’s been quite a while since we've posted a new topic. Send us a comment with your answers and watch for part 2, where we’ll share more information about how babies learn to sit up! Funny you should ask, as my son (my 2nd child) just started sitting up this past weekend fairly reliably. He will be 6 months next Tuesday (10/30). He'd been a supported sitter for some time, so we'd play with him sitting facing me and leaning lightly on my feet for a few weeks. Now that he's sitting independently, it honestly hasn't changed much yet (I think he prefers to be on his back or tummy still), but I know it *will* change once he can get himself into a seated position. I can't remember when my daughter started sitting on her own! If it doesn't already exist somewhere on your blog (I couldn't find it), I suggest adding links to the series you've posted, so that readers can easily access the entire series without having to search through links, guessing keywords, etc. Keep up the great work! My daughter just started a few weeks ago. She was about 6 months and a week. Playtime hasn't changed much. Before we would get on the floor together and she would sit in my lap (supported) and we would play with her toys that way or read a book together. Now she can sit on her own and I sit beside her. One thing that has changed is that I put all of her little boys in a small box and put that in front of her. She likes to dig in the box and pull the toys out one by one. She couldn't do that before while on her back or tummy. My daughter was about 6 months old when she first started to sit independantly. I remember it suddenly seemed like she had a much better time at daycare and was able to really start to play independently for the first time. 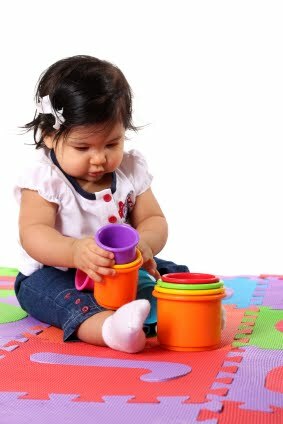 It also seemed like around that time she started to take more of an interest in holding toys, moving them between her hands and also in interacting with the other babies at daycare. Wow! More Than One Million!